I listened to a FANTASTIC podcast featuring 5 time Tarpon Gold Cup Champion Andy Mill. Andy is a former Olympic downhill skier turned saltwater fly fishing guru who knows his stuff. If you've read much about tarpon fishing, then you've read about Andy. He has his own style of fishing which is a version of the "down and dirty." The podcast is great and Andy really tells some of his secrets. He fishes with his son quite a bit when he is on the platform and his rule is that if his son doesn't land the fish in 5 minutes, he's got to hand over the rod. His techniques have really changed the sport of tarpon fishing. The other thing I really admire about Andy is just that he lives my kind of lifestyle. A house in Aspen and a house in Boca Raton. He gets to fish with a guide 30 days per year and that's pretty darn cool. "I don't know about you but I take comfort in that. It's good knowin' he's out there. The Dude. Takin' 'er easy for all us sinners." Okay, that's a Lebowski quote but it just seems to fit. Thinking about Andy and his accomplishments also makes me think about all the other greats of saltwater fly fishing. Ted Williams, Lefty, Flip, Steve Huff, Chico Fernandez, Sandy Moret, Stu Apte, Del Brown and the list goes on and on. Who am I missing? Send me an email at bonefishflat@gmail.com and let me know. These guys were real pioneers doing things with fly rods that were supposed to be impossible. 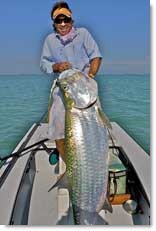 Amazing that we can land a 200 lbs tarpon with a fly rod. I think I want to catch a tarpon now. Maybe it's time to book a trip to the keys.